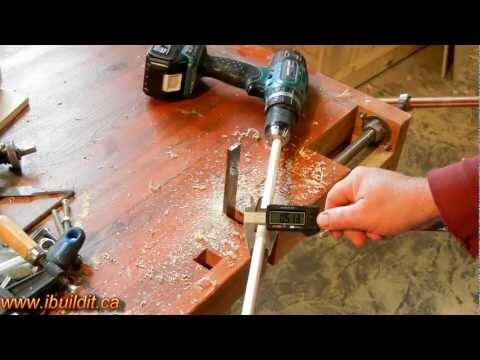 This homemade method comes to us from IbuildIt.ca, and I like it because it is really simple to make and it can produce accurate dowels at the size you need. All that is required to make this jig is some hardened steel and a few drills bits. I will let you watch the video below and visit the authors site to get the full instructions, but the idea is that a large hole is drilled into the hardened steel and it is sized to match your desired dowel diameter. The curves created from drilling two smaller holes on the edge of the larger hole act as teeth to cut the dowel. Now all you have to do is cut some stock a little larger than the hole and use your drill to run the stock through the hole.